KetoVie now addresses the challenges that many families face when their child needs a ketogenic formula that is easier to digest. KetoVie Peptide is the first and only ketogenic peptide based formula for individuals with impaired digestive function or intolerance to intact proteins. 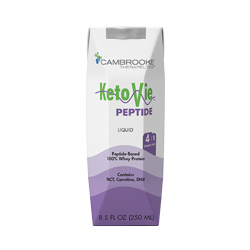 KetoVie Peptide is a nutritionally complete 4:1 ketogenic ratio partially hydrolyzed protein based formula for both tube and oral feeding. Ketogenic Ratio – 4:1 ratio (fat grams: carbs + protein). Complete Nutrition – Nutritionally complete formula for patients 3+ years of age. Protein – Enzymatically hydrolyzed whey with 8.1 g protein: small peptides (77% ≤ 1,250 Daltons) for patients with impaired GI function or intolerance to intact proteins. For the dietary management of intractable epilepsy and other conditions where a ketogenic diet is indicated. A 4:1 ratio (fat: carbohydrate + protein) hydrolyzed whey protein based enteral ketogenic formula that is nutritionally complete for ages 3 years and up. Appropriate for individuals with impaired GI function and/or intolerance to intact proteins. It can be used as the sole source of nourishment. Must be administered under medical supervision only. Designed for individuals over 3 years of age. Water, high oleic canola oil, whey protein hydrolysate (milk), medium chain triglycerides, citric acid ester of mono and di-glycerides, vitamin and mineral blend (tricalcium phosphate, calcium lactate, choline bitartrate, sodium ascorbate, magnesium phosphate, L-carnitine tartrate, niacinamide, vitamin E acetate, zinc sulphate, D-calcium pantothenate, manganese sulphate, ferrous sulphate, riboflavin, pyridoxine HCl, thiamin HCl, folic acid, vitamin A palmitate, potassium iodide, copper gluconate, sodium selenite, sodium molybdate, vitamin K1 phytonadione, vitamin K2 menaquinone-7, chromium chloride, biotin, potassium chloride, calcium citrate, sodium phosphate, vitamin D3 cholecalciferol, vitamin B12 cyanocobalamin, myoinositol), natural flavours, cellulose gel, inulin, mono and di-glycerides, DHA algal oil, sodium hexametaphosphate, taurine, L-tyrosine, L-phenylalanine, steviol glycosides. Contains milk.